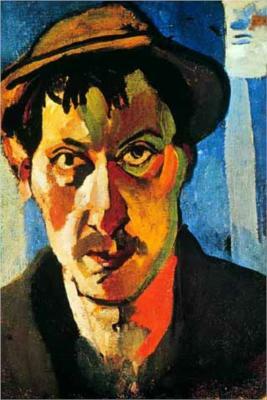 Derain was born in 1880 in Chatou, Yvelines just outside Paris. In 1895 Derain began to study on his own, contrary to claims that meeting Vlaminck or Matisse began his efforts to paint, and occasionally went to the countryside with an old friend of Cézanne’s, Father Jacomin along with his two sons. In 1898, while studying to be an engineer at the Académie Camillo, he attended painting classes under Eugène Carrière, and there met Matisse. In 1900, he met and shared a studio with Maurice de Vlaminck and together they began to paint scenes in the neighborhood, but this was interrupted by military service at Commerce from September 1901 to 1904. Following his release from service, Matisse persuaded Derain’s parents to allow him to abandon his engineering career and devote himself solely to painting; subsequently, Derain attended the Académie Julian. Derain and Matisse worked together through the summer of 1905 in the Mediterranean village of Collioure and later that year displayed their highly innovative paintings at the Salon d’Automne. The vivid, unnatural colors led the critic Louis Vauxcelles to derisively dub their works as les Fauves, or “the wild beasts”, marking the start of the Fauvist movement. In March 1906, the noted art dealer Ambroise Vollard sent Derain to London to produce a series of paintings with the city as subject. In 30 paintings (29 of which are still extant), Derain presented a portrait of London that was radically different from anything done by previous painters of the city such as Whistler or Monet. With bold colors and compositions, Derain painted multiple pictures of the Thames and Tower Bridge. These London paintings remain among his most popular work. Art critic T.G Rosenthal: “Not since Monet has anyone made London seem so fresh and yet remain quintessentially English. Some of his views of the Thames use the Pointillist technique of multiple dots, although by this time, because the dots have become much larger, it is rather more simply the separation of colors called Divisionism and it is peculiarly effective in conveying the fragmentation of color in moving water in sunlight.